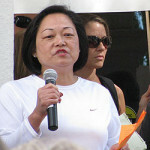 Mei-Jung Lu Gaffney is the owner of Madam Lu Chinese Restaurant on State Street & Mama Lu on Milpas Street. Born in Taiwan, she was introduced to the art of “Country Style Chinese Cooking” because her family owned a local restaurant. She believes this type of cooking sets her apart from other Chinese restaurants in town because of its down-home taste. 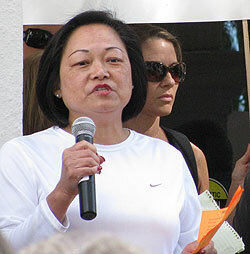 Arriving in the states over 3 decades ago, she worked for a lot of people in Santa Barbara. Roughly 15/yrs ago she realized enough knowledge had been gained to open her own restaurant. Happily, now the same people she worked for come to her restaurant as customers and friends. All her chefs are Chinese. She believes in providing friendly, great service. Naturally, many of the staff are family members, because it is a family business. From her brother running Mama Lu, to her son & nephew delivering food to customers. However, she does have long-term employees who are like family, the longest has been with her for 9/yrs. 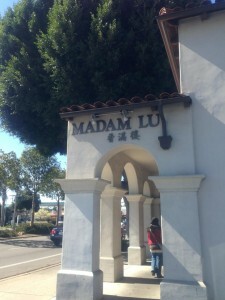 When you walk into Madam Lu’s, she equates it to “walking into a friends house to sit down for a good home cooked meal and delightful conversation.” The restaurant atmosphere can be very lively at times, and she likes it that way. Lu is a staunch supporter of the local fisherman at the Santa Barbara Harbor. Rockfish is purchased exclusively from them. Giving back to the community is a no-brainer . She is a member of the MCA (Milpas Community Action) organization, and contributes to many local charities like the “Empty Bowl” which supports our local food bank. So, come in and enjoy the daily luncheon buffet of Chinese delights, and our signature: Peking Duck, Sizzling Rice Soup and Orange Chicken.